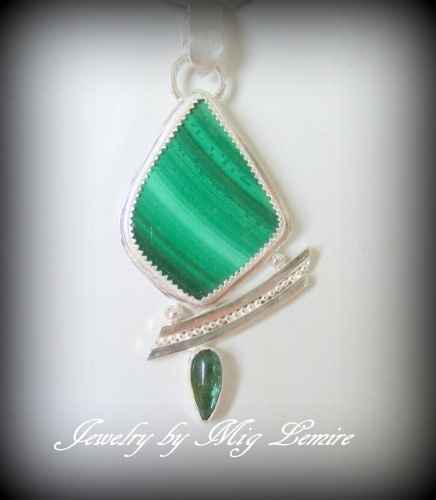 This gorgeous pendant is made from an really dramatic Malachite gemstone with a dripping green Tourmaline drop. One of a kind piece soldered in sterling silver framework and accented with thick sterling and beaded pieces in between the Malachite and Tourmaline. One of a kind pieces! Piece measures 2" long and 1" wide at its widest part. Comes with a sterling silver snake chain.